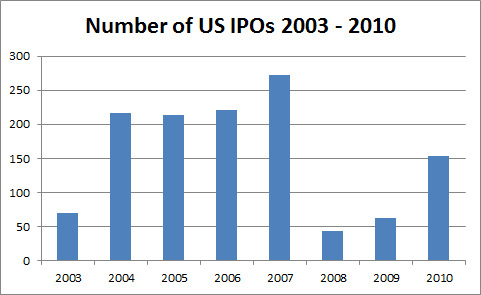 As the economy started to improve in 2010, though very slowly, the IPO market also rebounded nicely. Actually, 2010 turned out to be a pretty good year for US IPOs, led by General Motors’ $15.8 billion blockbuster deal in November. Even though the total number of offerings in 2010 was no where near the booming years from 2004 to 2008 when more than 200 companies went public every year, there were still 153 companies going public in 2010 according to Renaissance Capital, five times the number of offerings in 2008, the first full year of the recession. The total proceeds from UP IPOs in 2010 reached $38.7 billion, an increase of nearly 77% from the 2009 level of $21.9 billion (see Renaissance Capital 2010 IPO review for details). In the US, Chinese companies comprised 27% of deal volume, compared with 18% in 2009 and 13% in 2008. Most Chinese IPOs relating to infrastructure and basic materials were routed to the Hong Kong Exchange, whereas most growth companies opted for a US listing. Catering to US investors’ demand for fast-growing companies, these US-traded Chinese IPOs tended to be relatively new companies, some barely past the start-up phase. In some cases, US investors were willing to suspend some of the standards of critical mass and corporate governance that apply to US small cap growth companies because of the prospects for extremely rapid growth offered by these Chinese companies. However, not every Chinese IPO generated the same amount of enthusiasm among investors, despite strong appetite from US investors. Some of them faded rather quickly after their IPOs. For example, China Hydroelectric (CHC), an operator of small hydroelectric plants in China, raised $96 million on January 24, 2010. The IPO price of CHC was $14.80, but the stock closed the year at $7.31 on December 31, 2010, representing a 50% loss, the largest among 2010 Chinese IPO stocks. On the other hand, Bitauto Holdings Limited (BITA), a leading provider of Internet content for the automotive industry in China, saw its share price more than tripled in just over a month from its IPO price of $2.00 on November 16, 2010. Following is a list of Chinese IPO stocks in 2010 with IPO prices and returns of 2010. If you have bought any of these, you can see how your investments compared against others.